I clearly remember the first time I ate a version of this dish. I was six years old and couldn't tolerate spicy food at the time. But this cabbage stir-fry was so good, I ate as fast as I could, tears streaming down my face. I figured if I ate really fast I wouldn't feel the pain, and so I wouldn't have to stop eating. Don't worry, the recipe isn't that spicy; I just had a delicate palate as a child. I like my cabbage with some crunch left in it, but if you prefer, you can continue cooking until the cabbage is quite soft. Heat the oil in a large wok over high heat. When the oil begins to smoke, add the mustard seeds, covering the wok with a lid or spatter screen. 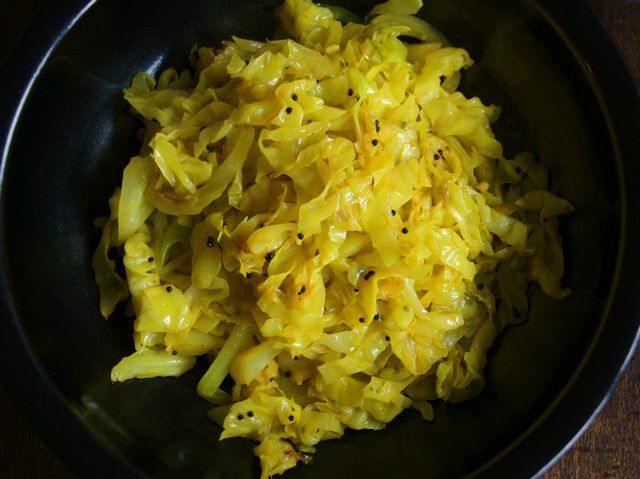 After the seeds stop sputtering, add the turmeric and sliced cabbage. Now add the garlic (if using), salt, and cayenne. Toss well. Cover, reduce the heat to medium, and steam until the cabbage is crisp-tender, about 5 minutes. Serve hot. Tadka is the basic Indian method for transferring the flavor of spices to food. First the spices are added to a very hot oil, then the sizzling infusion — tadka — is used to flavor the dish.